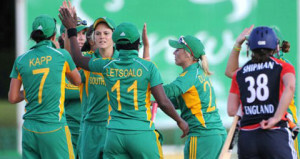 Mignon du Preez recently led South Africa to their first semi-final at the World T20. The 24 year old captain is a product of Mini Cricket in South Africa and is a batting specialist for the National team. Having played provincial hockey, table tennis and tumbling as well, it is clear that Mignon is an all-round sports star. We sat and chatted to Mignon about all things sport. ATJ: Firstly thank you for making the time to do this interview with us! What have been the highlights of your career thus far? MP: Making the Semi-Finals of the recent ICC T20 Women’s World Cup. 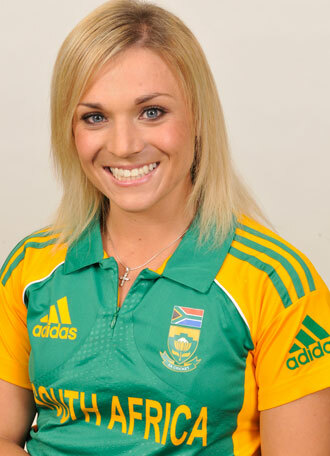 Becoming captain of the Momentum Proteas. Scoring my debut 100* and reaching my 1000th run milestone in the same match last year. 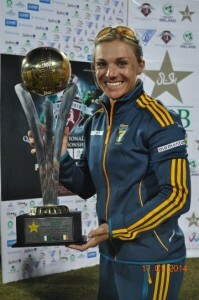 Being CSA’s Women’s Cricketer of the year 2010. Scoring 258* of 96 balls at the age of 13. 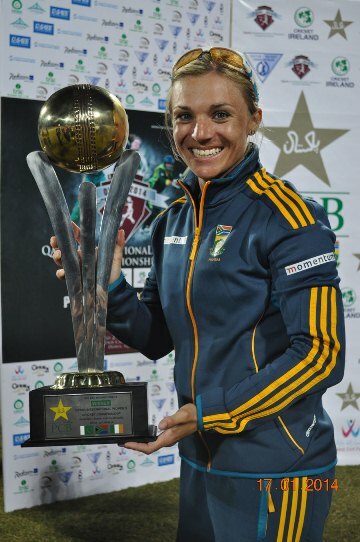 ATJ: What are the biggest challenges facing women’s cricket in South Africa? MP: I think the biggest challenges are the lack of media coverage and playing opportunities to enhance public awareness of our existing role models, so that young girls (future stars) can be inspired to take up cricket as a sport. ATJ: You made your international debut aged 17, what was that like? MP: Firstly a very big honour, but I think when you are so young, you play fearless cricket, probably because you play without thinking too much. ATJ: And since that debut you have piled on the runs and now you’re the South African women’s cricket teams 3rd highest run scorer in ODI’s. Do you feel you can become the highest run scorer for the national team? MP: I am not much of a “statistician”, but I certainly hope so. ATJ: As captain of the national side, what pressure does this add to your game? MP: It adds quite a bit of pressure because there is suddenly an expectation that you need to lead by example all the time, thus knowing the game better than anyone else and knowing the opposition. You also have to make difficult decisions at crucial stages in the game which can be the difference between winning and losing etc. ATJ: I’ve read you’re truly multi-talented having All Star colours in Softball, etc, if you didn’t end up playing cricket, which sport would you be playing? MP: I think either hockey or softball. ATJ: What do you do outside of cricket? MP: I have an honours degree in marketing so I tend to keep busy with entrepreneurial activities, participate in and support social responsible initiatives. Spending quality time with my family and my boyfriend remains a priority in my life. ATJ: Who has been the most talented cricketer you’ve played with? MP: AB de Villiers, I’ve played with him in a KFC Mini Cricket Kids vs Proteas tour match. The players in our Momentum Proteas squad are so talented – it is very difficult to select someone, as each player is unique. In 2007/8 I played with Jomari Logtenberg – I recall our 4th wicket ODI partnership of 224 – she comes to mind, however she unfortunately stopped playing cricket in the same year. ATJ: We loved the KFC Mini Cricket kids vs the Proteas! Having played against a few now, which cricketer has been the biggest challenge for you to play against? MP: T20 – Deandra Dottin (West Indies) and Charlotte Edwards (quite intimidating with her amount of experience as England`s captain). ATJ: And you have also played in quite a lot of stadiums, which is your favourite stadium to play in? MP: Newlands – It has a breath taking scenery and has good memories of us winning a series against West Indies. Wanderers – Very fond memories since I scored my debut 100 there. ATJ: What are your aims for the current season? MP: Keep growing as a captain and lead by example. Being a consistent run-scorer for the team. Scoring my 2nd 100. Moving into the Top10 ICC reliance rankings. ATJ: Since All Things Jabu is about all sports – which teams do you support? MP: All teams representing South Africa to start with, however I have a special place in my heart for our players with disabilities competing at international level. Generally I follow the Proteas, Springboks, Titans, Blue Bulls, all IPL teams, SA Hockey, Netball and Bafana-Bafana. Follow Mignon on Twitter and show her the support of SA!